The crown flower has blossoms that are used in lei-making. Crown flower leis have royal symbolism. The blossom's petals roll back and expose what looks like a small crown. 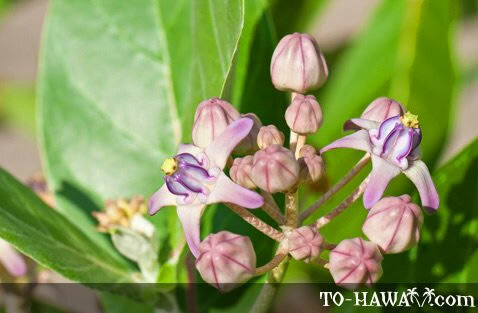 This flower was a favorite of Queen Liliuokalani, Hawaii's last queen. The crown flower plant has thick stems and leaves. The blossoms emit a sweet scent. The shrub prefers coastal areas and can grow up to 15 feet (4.6 m) tall. The plant produces a milky sap that can irritate the skin and is poisonous in large quantities.